What is keeping HBO&apos;s The Leftovers from being an unmemorable flash in the pan? It&apos;s not the writing — for every genuinely interesting character arc (a gun-toting widow, a gambling priest), the show pulls greedily from the cliche grab-bag (hot-cop anti-hero, token nymphet best friend). And it&apos;s not the show&apos;s star, Justin Theroux, who has attracted more attention for his crotch bulge than for his performance, with good reason. The most original thing about HBO&apos;s new series is the Guilty Remnant, a cult of former spouses and family members who, in the wake of the Rapture-reminiscent disappearance of some 2% of the world&apos;s population, have decided to live according to the 10 commandments of depression. Namely: Nothing matters and there&apos;s no such thing as family. For the Guilty Remnant, who can&apos;t even let a memorial service for the departed go undisrupted, the only thing worth holding onto is, oddly enough, cigarettes. In the midst of so much praying and preaching, they&apos;ve taken to puffing — and they&apos;re the heaviest smokers on TV. Along with their all-white uniforms and their initiatory tree-chopping ceremonies, the cigarettes constitute part of their shtick — indeed, the members of the Guilty Remnant are rarely seen on screen without one. Smoking is, in fact, such a pronounced motif, such a comically repetitive part of the show&apos;s imagery, that NPR finally asked Tom Perrotta, the show&apos;s co-creator and the author of the book on which it&apos;s based, what it meant. His response: "It&apos;s a declaration of faith and a sense that they have that there&apos;s no future and they don&apos;t have to worry about their health … They see themselves as bearing witness, and there is this guilty sense — they believe that they were rejected by God." Cigarettes in The Leftovers, act as the central symbol of the Guilty Remnant&apos;s nihilistic creed. What the crucifix is to Christians, the Marlboro Red is to the Guiltys. Signally, one of the only other characters on the show seen smoking is Chief Kevin Garvey&apos;s (Theroux&apos;s) hopeless daughter, Jill, who, in the midst of normative teenage confusion, is carving our her own brand of Guilty Remnant-esque resignation. The symbol of the cigarette is not only effective (such heavy puffing, together with the Guilty Remnant&apos;s perpetual pouts, really does telegraph dejection), it also marks a significant turn in the depiction of smoking on TV. What once symbolized hipness, or villainy or even sexiness now symbolizes anhedonia, and The Leftovers is leading the way. In order to be effective, symbols have to be able to tap into near-universal feelings and experiences. Bitten apples work because we&apos;re all, to some extent, familiar with the Genesis story. Ravens, whether you&apos;ve read Poe are not, serve as clear harbingers of doom. The cigarette-as-hopelessness is a new entry in the symbolism canon, and it&apos;s specific to our time. Brought up to speed as we are on the deleterious effects of smoking, television may be ridding itself of the notion that cigarettes are the universal symbol for cool. Such a demonization of smoking stands in stark contrast to the history of film and TV. According to the Independent, Hollywood actors and actresses lit up an average of 10.7 times per hour of screen time in the 1950s. By the 1980s — due in no small part to the efforts of health-minded organizations like the Entertainment Industries Council — this number had sunk to 4.9. Today, cigarettes make frequent cameos in movies and shows, and the rate of appearance, according American Journal of Public Health has even gone back up. But the smoking that appears on TV today — most notably (with inarguable sophistication) by the characters on Mad Men — does so in an altered context. In today&apos;s era in which the cigarette is hardly more acceptable than meth, smoking that isn&apos;t used to illustrate despair, such as that in The Leftovers, is used to remind us of the days when it was the hot thing to do. This was the argument made by critic Katie Roiphe, who saw in Mad Men’s copious smoking (and other indulgences of vices) a deeper motive than period-show verisimilitude. She wrote in the New York Times: "The phenomenal success of [Mad Men] relies at least in part on the thrill of casual vice, on the glamour of spectacularly messy, self-destructive behavior. … As a culture we have moved in the direction of the gym, of the enriching, wholesome pursuit, of the embrace of responsibility, and the furthering of goals." It&apos;s an audience of wholesome, enrichment-seeking gym-goers that intuitively understands what The Leftovers is saying with all its cigarettes. 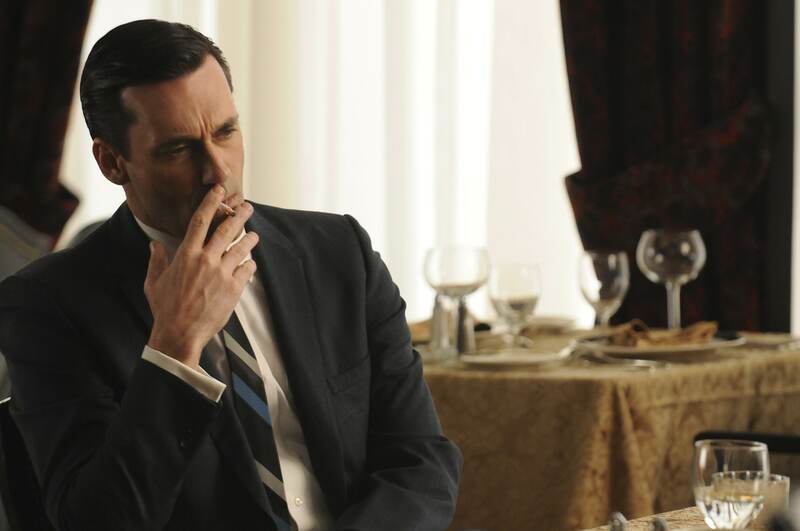 If Mad Men harks back to the glory days of smoking, The Leftovers luxuriates in its present disgrace. The show isn&apos;t alone in seeking to end smoking&apos;s long run as the premier image of cool. In NBC&apos;s upcoming series Constantine, the hero, who in the original comic-book series boasts a smoking habit that would put the Guilty Remnants to shame, will light nary a cigarette. "The occult detective will be missing what many would consider an essential ingredient of the character," Screen Rant reported. "A move largely attributed to network standards and practices." Smoking is, of course, a life-endangering habit. And if decreased representation or on-screen damnation of cigarettes leads, over time, to a decline in smoking, especially among the young, then that&apos;s great. But one has to wonder if it&apos;s really cigarettes that are being vilified, or if it&apos;s the attitudes that smoking once symbolized — sleaziness, sexiness, glamour, peril — that are being put to rest. In any case, it&apos;s clear that the 20th century&apos;s symbol for cool has become the 21st century&apos;s symbol of despair — the cigarette is not just a health-hazard end to life but a full-bore, spiritual renunciation of it.